Elijah Jacobs works to take down an Olathe Northwest wrestler in a dual meet January 16. Free State’s wrestling team claimed another impressive dual win Wednesday afternoon. 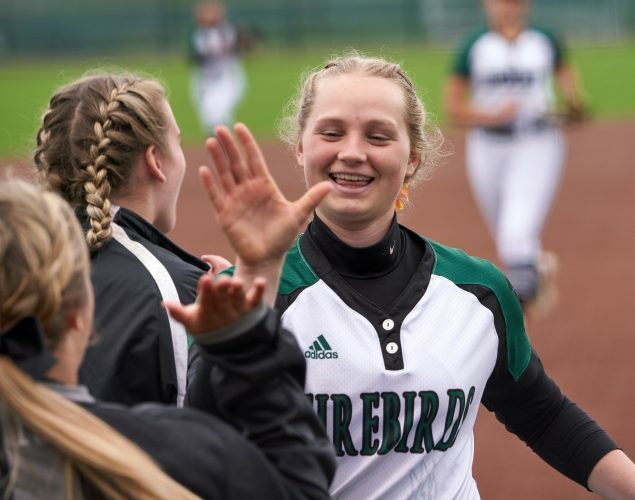 Despite the meet being moved up two hours due to potential weather, the Firebirds took care of business from the very beginning. 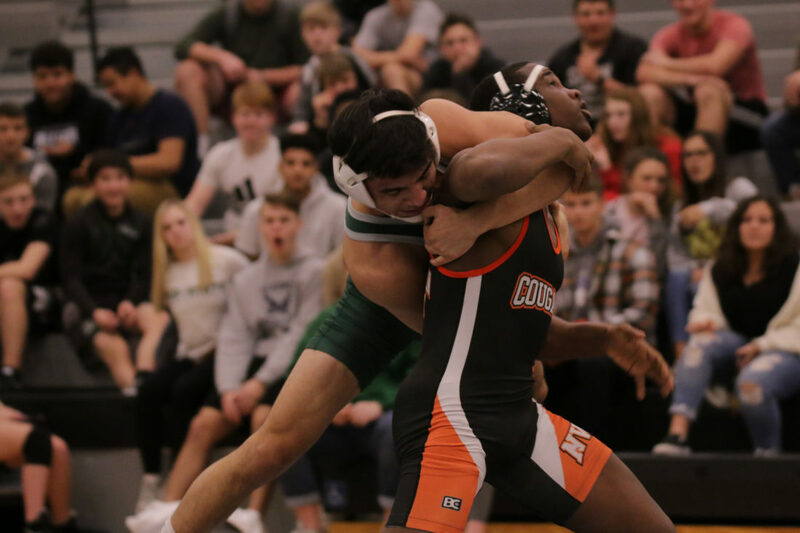 Free State defeated Shawnee Mission West by a 64-12 margin to extend its dual winning streak to 38 consecutive matches. Ben Mellenbrunch, Trey Shanks, Lou Fincher, Caleb Streeter, Jordan Kryfka, Devin Beers, Austin Burenheide, Joey Schmidtberger and Xavier Farley all recorded pins. Chance Brandon also claimed an 11-0 decision, while Joey Eddie earned a win via forfeit. Only two matches even went the full three rounds. Free State wrestling will travel to Blue Valley Northwest at 4 p.m. Saturday. 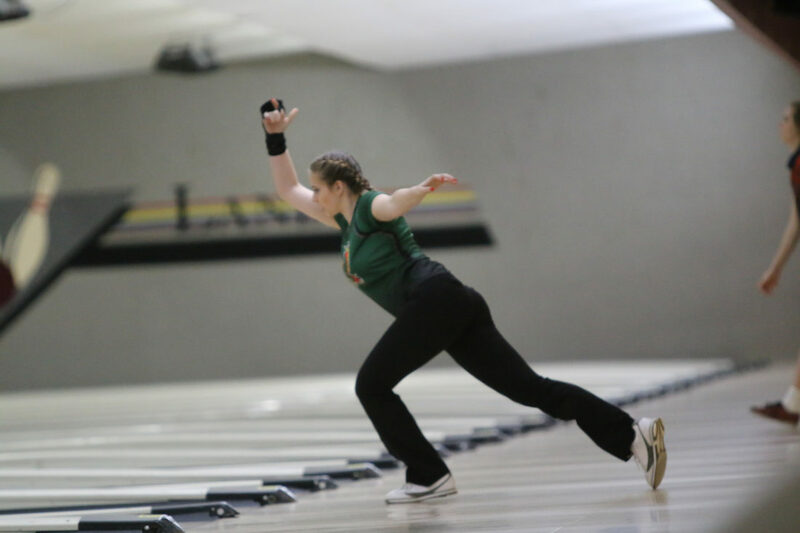 The Free State bowling team hosted another meet Wednesday afternoon, though this one was much smaller than the 16-team season opener. In the triangular, the varsity boys placed second with 2,336 points. Shawnee Mission West won the event with 2,388 points, and Olathe South was third with 2,275. On the girls side, Free State took second with a score of 1,884. Olathe South finished first in the event with 2,057, while Shawnee Mission West took third with 1,792. A Free State bowler sends the ball down the lane in a tournament at Royal Crest Lanes, January 11. For the girls, Sydney Jordan posted the highest score with a 509 to take third. Raegan Finkeldei claimed 10th with a series score of 470. On the boys side, Bayn Schrader netted second with a 601, though he was one of five FSHS bowlers to finish in the top 10. Joey Taylor netted sixth with a 576. Boys team scores: 1. SM West 2,388; 2. 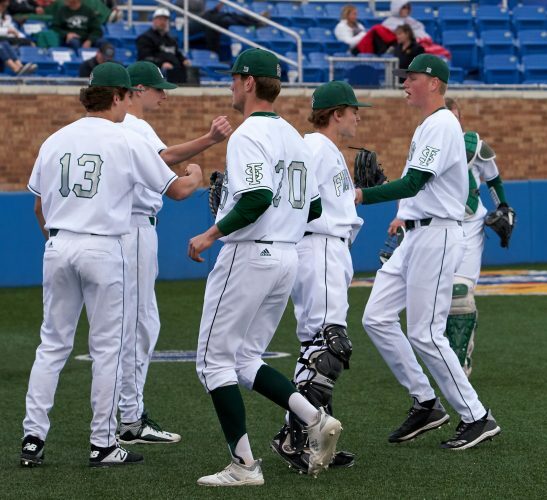 Free State 2,336; 3. Olathe South 2,275. Girls team scores: 1. Olathe South, 2057; 2. Free State, 1,884; 3. SM West, 1,792. Boys results: 2. Bayn Schrader, 601; 6. Joey Taylor, 576; 8. 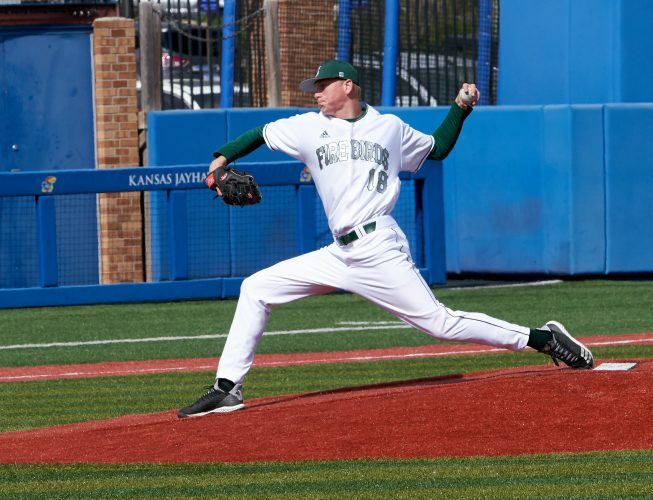 Ryan Flakus, 563; 9. Mike Tennyson, 551; 10. A.J. Baker, 547; 17. John Hamer, 449. Girls results: 3. Sydney Jordan, 508; 6. Raegan Finkeldei, 489; 10. Lexie Lockwood, 470; 11. 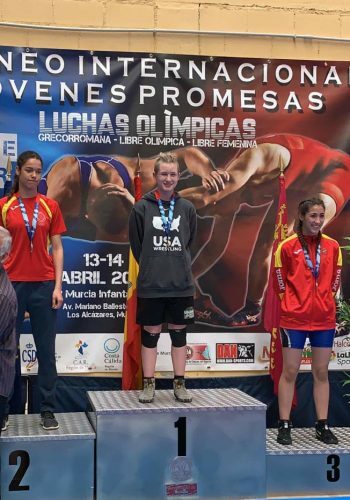 Hannah Schenkel, 415; 15. Rena Stoupakis, 316; 16. Ashley Edwinson, 260. Free State’s boys swim team placed second at a triangular with Blue Valley West and Blue Valley Southwest on Tuesday. Blue Valley West won the event with 152 points, while Free State placed second with 111 points. Blue Valley Southwest scored 49 points to finish third. 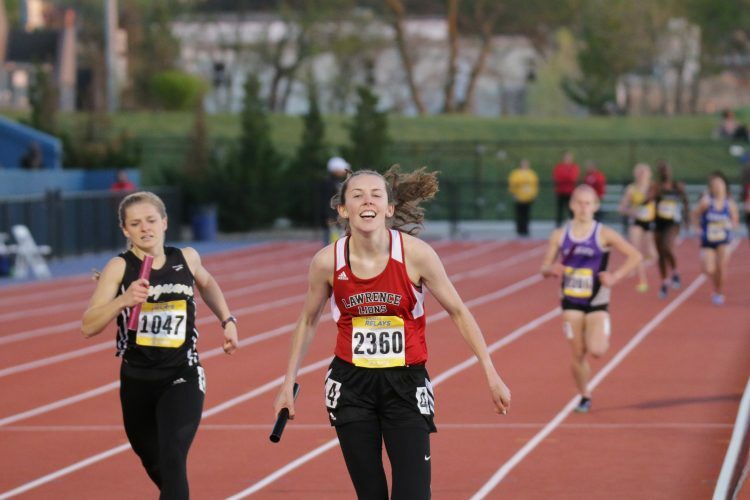 The Firebirds won four of the 12 events during their runner-up finish. Benjamin Vorthmann won the 50-yard freestyle with a time of 22.88, and he also finished first in the 100-yard freestyle with a mark of 48.75. Reilley Moore notched first in the 100-yard butterfly with a time of 52.67. Free State also won the 200-yard freestyle relay with a time of 1:32.72 behind the efforts of Vorthmann, Brady Flynn, Riley Sirimongkhon-Dyck and Chad Anderson. 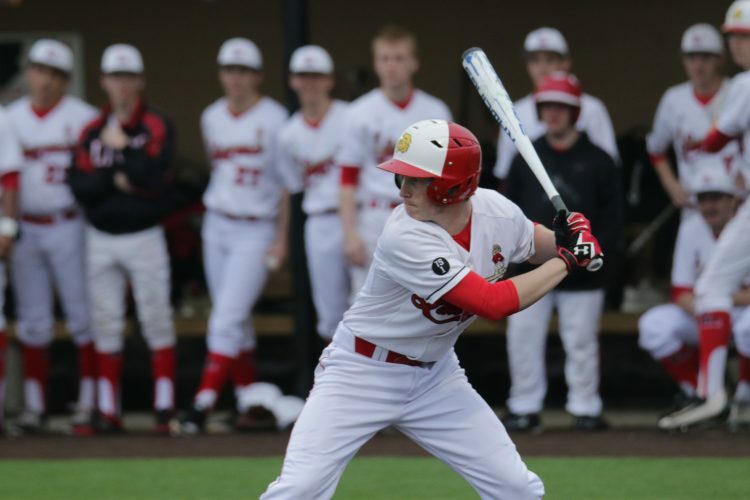 FSHS will return to action at 12:30 p.m. Tuesday at Hummer Sports Park. Team scores: 1. Blue Valley West 152; 2. Free State 111; 3. Blue Valley Southwest 49. 200 medley relay: 2. Jake Viscomi, Riley Sirimongkhon-Dyck, Reilley Moore, Brady Flynn, 1:44.22. 200 freestyle: 2. Reilley Moore, 1:52.31; 4. Finn VanDyke, 2:00.37; 7. Trenton Harman, 2:07.73; 10. Niels Braaten, 2:20.82. 200 IM: 2. Riley Sirimongkhon-Dyck, 2:07.67; 5. Devon Lyle, 2:15.20; 11. Max Bates, 2:31.49; 12. Alexander Moore, 2:34.34. 50 freestyle: 1. Benjamin Vorthmann, 22.88; 4. Brady Flynn, 23.71; 8. David Stuart, 24.61; 18. Aiden Basore, 27.66; 20. Jacob Heinz, 27.71. Diving: 4. Jack Keathley-Helms, 133.80. 100 butterfly: 1. Reilley Moore, 52.67; 3. Jake Viscomi, 56.99; 11. John Kelley, 1:15.13. 100 freestyle: 1. Benjamin Vorthmann, 48.75; 3. Brady Flynn, 52.27; 5. Finn VanDyke, 53.53; 6. David Stuart, 55.89; 10. Zach Bollinger, 59.07; 14. Jacob Heinz, 59.48; 17. Viet Nguyen, 1:00.48; 20. Niels Braaten, 1:02.43. 500 freestyle: 2. Chad Anderson, 5:14.09; 7. Devon Lyle, 5:36.40; 10. Trenton Hartman, 6:00.85; 13. John Kelley, 6:29.83. 200 freestyle relay: 1. Benjamin Vorthmann, Brady Flynn, Riley Sirimongkhon-Dyck, Chad Anderson, 1:32.72. 100 backstroke: 2. Jake Viscomi, 59.72; 7. Max Bates, 1:06.99; 10. Alexander Moore, 1:10.97. 100 breaststroke: 2. Riley Sirimongkhon-Dyck, 1:03.00; 6. Chad Anderson, 1:10.81; 9. Zach Bollinger, 1:15.91; 10. Viet Nguyen, 1:16.04; 15. Aiden Basore, 1:25.97; 18. Owen Polson, 1:31.17. 400 freestyle relay: 2. Benjamin Vorthmann, Jake Viscomi, Chad Anderson, Reilley Moore, 3:21.85. 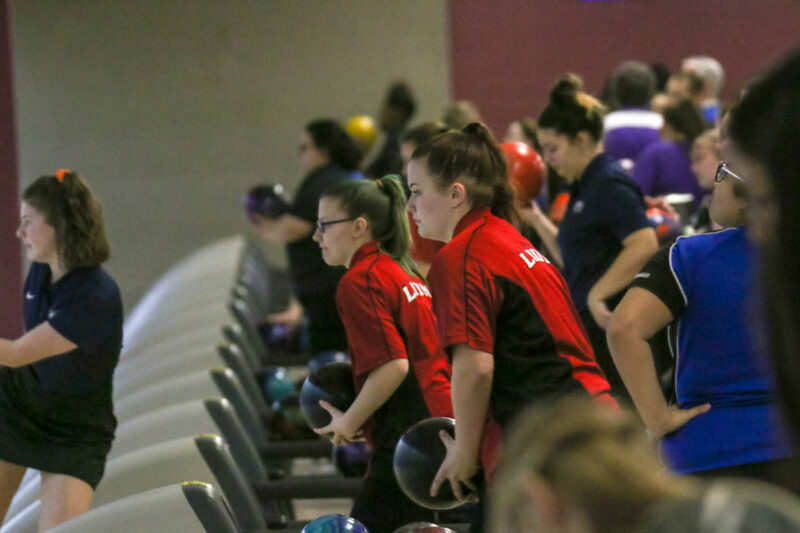 The Lawrence High bowling team got plenty of time in the lanes this week, competing in two different meets in as many days. On Tuesday, LHS girls placed third out of four teams at the Seaman quadrangular. The Lawrence boys team, meanwhile, took fourth place. In the event, Jayden Cress claimed third in the varsity boys competition with a series score of 648. Emile Rodman medaled in the the girls competition, scoring 528 to take sixth. A Lawrence bowler gets ready for her approach in a tournament at Royal Crest Lanes, January 11. The Lions then went to the Olathe Lanes East bowling center Wednesday. The varsity boys finished second out of three teams, while the girls team placed third. Rodman was the lone medalist from both teams, notching third with a series score of 491. Varsity boys: Jayden Cress 192-244-212, 648; Andrew Flynn 168-486-175, 496; Lorenzo Dan 159-158-160, 477; Josh King 148-179-145, 472; Rhett May 132-138-132, 402; Nick Wallace 100-122-104, 326. Varsity girls: Emilie Rodman 181-168-179, 528; Skyler Scrivner 172-193-127, 492; Ashley Dykes 181-122-174, 477; Alexis Foster 135-173-164, 472; Lana Chieu 156-151-158, 465; Jojo Blackwood 158-137-162, 457. Varsity boys: Andrew Flynn 161-202-224, 587; Jayden Cress 181-195-171, 547; Sebastian Daniel 179-175-179, 533; Lorenzo Dan 184-160-171, 515; Joey Thurman 168-122-179, 469; Josh King 89-120-132, 341. 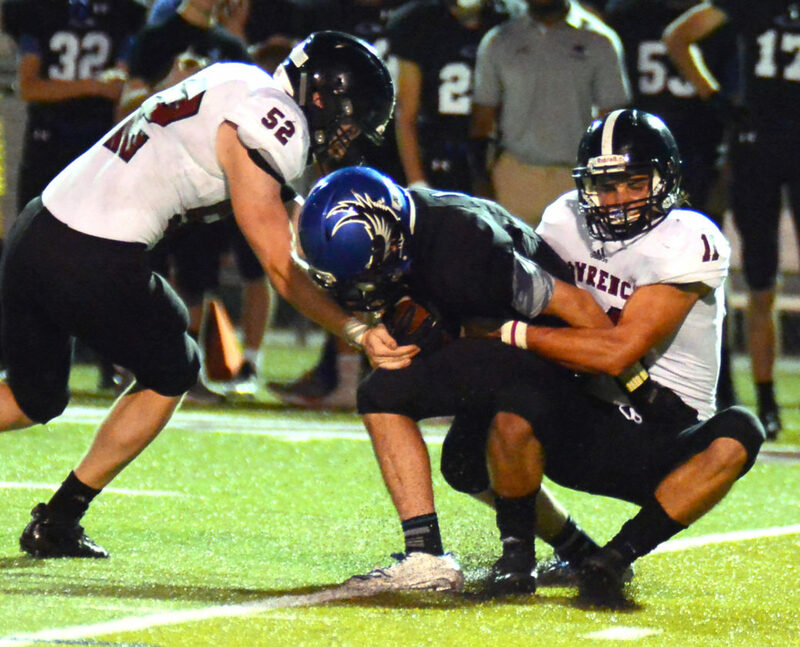 Lawrence senior linebacker Caleb Mondi has found his next stop on the gridiron. Lawrence High School’s Sam Bart (52) and Caleb Mondi (11) stop an Olathe Northwest player as the two schools face off on Thursday, Sept. 20, 2018 at College Boulevard Activity Center.